A man was assaulted in Merseyside today just yards from where Prince Harry and Meghan Markle had opened a youth club only minutes earlier. 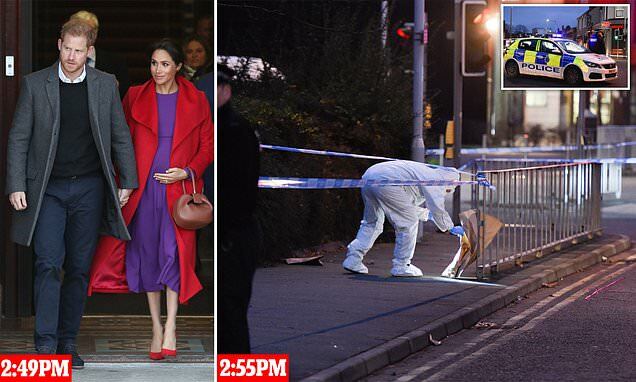 The 49-year-old man was attacked in Birkenhead at 2.55pm, nine minutes after the royal couple had left their engagement at the youth centre in an adjacent street. Local residents have reported seeing blood on the ground in the aftermath of the attack, according to the Liverpool Echo. Tonight forensic officers were guarding a cordon at the scene while the victim fights for his life in hospital after suffering a serious head injury. The Duke and Duchess of Sussex left The Hive youth centre at 2.46pm after officially opening the centre for children from deprived neighbourhoods. Just nine minutes later the violence broke out nearby when a man got out of his black Jaguar after something was reportedly thrown at it. A Merseyside Police spokesperson said: 'It is thought that the victim got out of the car and a struggle ensued between the victim and four males. 'During the incident the victim sustained a serious head injury. He has been taken to hospital where his condition is described as critical.